The fabulous collections housed in the world’s most famous museums are trophies from an imperial age. Yet the huge crowds that each year visit the British Museum in London, the Louvre in Paris, or the Metropolitan in New York have little idea that many of the objects on display were acquired by coercion or theft. Now the countries from which these treasures came would like them back. The Greek demand for the return of the Elgin Marbles is the tip of an iceberg that includes claims for the Benin Bronzes from Nigeria, sculpture from Turkey, scrolls and porcelain taken from the Chinese Summer Palace, textiles from Peru, the bust of Nefertiti, Native American sacred objects and Aboriginal human remains. 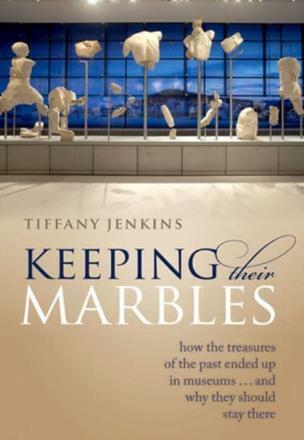 In Keeping Their Marbles, Tiffany Jenkins tells the bloody story of how western museums came to acquire these objects. She investigates why repatriation claims have soared in recent decades and demonstrates how it is the guilt and insecurity of the museums themselves that have stoked the demands for return. Contrary to the arguments of campaigners, she shows that sending artefacts back will not achieve the desired social change nor repair the wounds of history. Instead, this ground-breaking book makes the case for museums as centres of knowledge, demonstrating that no object has a single home and no one culture owns culture.